Do you want to be a key part of our wildfire investigations program? Do you have what it takes physically and mentally to withstand working long hours determining the origin and cause of wildfires in Alberta? Do you want to learn about wildfire and develop your investigation skills? If so, a Seasonal Wildfire Investigator position may be ideal for you. The Seasonal Wildfire Investigator will report to an experienced Provincial Wildfire Investigator and assist the Compliance and Investigations Unit to establish wildfire origin and cause. 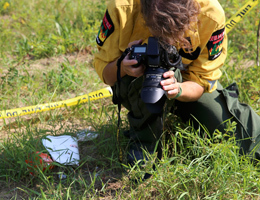 Seasonal Investigators will receive on the job training and guidance in wildfire origin and cause determination, while practicing their skills in investigative interviewing, evidence collection, and scene documentation. The typical work week is a 36.25 (7.25 hours/day). You may be required to work overtime. A vehicle is not required, however it is your responsibility to obtain transportation to and from work. While working, a vehicle will be available to perform work related duties. Successful completion of defensive driving is required to operate a Department vehicle. The position is provincially based, and as such you can expect to travel around to all areas of the province depending on the fire danger and requirements of the Department.